Taking the time to plan and design your xeriscape is paramount to success. Begin by accessing the strengths and weaknesses of your land. How does your property orient towards the sun and tradewinds? How much rain falls in your area? Then consider how you use your lawn. Is your backyard used for family activities or social gatherings? Do you need to store tools, cars or boats in your yard? Do you need to screen your property from view or preserve a view? All of these uses must be considered in your plan. After you have a good idea of your xeriscaping goals, its time to select the plants you want to include. Take the time to walk around your neighborhood and observe the plants that are growing wild in the fields and woods. These are the same plants that will do well in your xeriscape. Native plants are sure to succeed. And, here on Kauai, they are also quite beautiful. 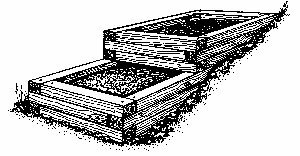 Terracing gives you a level area for planting. The last planning consideration is your budget. You can save a little by propagating from cuttings. It is faster, however, to choose quality plants from one of our island nurseries. Take a shovel and dig a small hole. Observe how hard it is to dig and what the soil looks like. Pour a gallon of water into the hole. While noticing how long the water takes to be absorbed, take a handful of wet dirt and squeeze it into a ball. If you can crumble that ball of dirt, then the chances are that you have good soil. If not, then it is time to start a compost pile or bin. 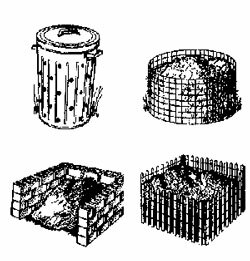 Composting is easy. just place any organic waste into the bin and let nature do the rest. You should not add meats or pet manure as they will attract pests and disease. Horse and cow manure can be added, however. Mix and water your bin occasionally. In a few weeks, you will be rewarded with the world's best soil improver. Grass requires more water than most other plants because the mat of blades and roots is so thick that water has a hard time penetrating. A thick green lawn only absorbs about 1/3 of an inch of water per hour. Any extra water simply evaporates or runs off. Xeriscaping limits grass to the areas where it is necessary. Backyards where children play and you entertain friends are perfect for grass. Less frequently used front and side lawns are candidates for trees, shrubs and groundcovers. Mulches are a great way to conserve water. They also reduce the need to weed, cool the soil, check erosion and are attractive. Plants love mulches. You can use organic mulches such as grass clippings, pine needles or bark (be careful in termite areas). 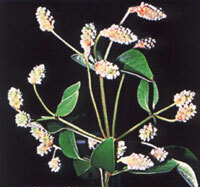 Spread these in an eighteen inch or larger circle around the base of a plant. To control weeds, spread your mulch to a depth of three to four inches. You can also use a special black plastic netting under the mulch to control weeds. Other popular mulches include red and black lava cinders and crushed coral. Xeriscape in zones. Place exotic imported plants, such as roses, close to your house and near downspouts from your gutters. This is the moderate water use zone. A little further away is the low water use zone. Place shrubs that require little water in this zone. Further out will be the very low water use zone. Native shade trees, palms and plumerias belong in this zone. 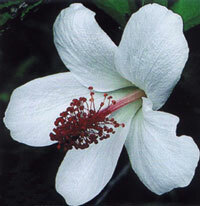 For a list of native Hawaiian plants visit http://biology.swau.edu/faculty/carr/natives.html. Or consult your favorite nursery. If your xeriscape contains grass, a well planned sprinkler system can save money. Be sure to include moisture sensors so the system can shut down when the ground is wet or when it is raining. Drip irrigation works best for trees and shrubs. Soaker hoses are the simplest solution to drip irrigation. Slotted pipe is a slightly more permanent solution. 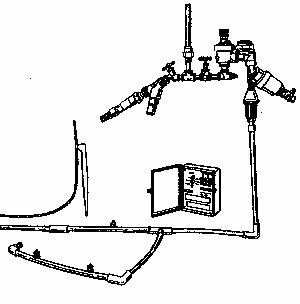 A good drip system consists of a pressure regulator, a filter, an anti-syphon valve and an automatic timer. Then, of course, there is the plastic tubing. All of this is available from your hardware store and will cost a few dollars. However, when you consider the cost of the water you now waste watering your plants, the return on your investment will not take that long. The use of grey water irrigation is another excellent way to reduce water demands. These systems are best installed by plumbers. Remember, the best time to water is early in the morning. By definition, xeriscapes require little maintenance. Water demands are low and theres little need to weed. Occasional trimming, mulching and composting should be all that is required. Of course, gardens are a source of great joy and tranquility. Spend as much time in yours as you can afford. As a demonstration, the Department of Water has plans to xeriscape their Lihue office (4398 Pua Loke Street, Lihue), which is just behind the Kukui Grove Office buildings. This xeriscape will use native plants selected for both their beauty and for their low water requirements. The plants will be provided by Kauai Nursery and Landscaping, Inc., Lihue. There are many other sources for native plants on Kauai. Most of our island nurseries can provide native plants. You can also contact the Kauai District Forester at 808-241-3433. Please dont collect plants from the wild. State of Hawaii Forestry and Wildlife Division regulations prohibit taking any plant or its parts without written permission. Endangered plants are never for sale as creating a market for endangered plants only increases their chance of extinction.